Mobile payment systems look to be the future of commerce. Here are five of the premier mobile payment tools your business can start using right away. Will cash and credit survive the Digital Age? According to a new survey conducted by Mobio Identity Systems, 94 percent of North Americans would be happy to complete payments through their phone if they knew the system were secure. Most merchants and small businesses choose to only accept cash or check to avoid paying the extra fee attached to processing a credit card. But now, a handful of mobile technology companies have devised cheap and simple mobile payment solutions to accommodate those small businesses that could not traditionally afford to accept credit cards. Considering the efficiency and affordability of these systems, even for the smallest of businesses, mobile payment systems might just be the future of commerce. 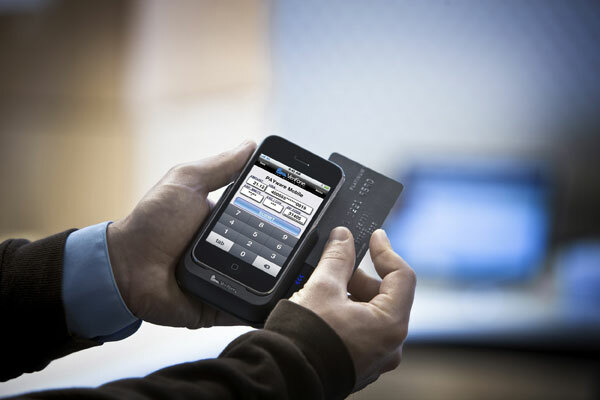 Here are five of the top mobile payment solutions currently available. Carol Realini, an accomplished entrepreneur and technology expert, retired in 2000 thinking she’d never work again. But during a volunteer trip to the African Congo, Realini witnessed several Congolese paying for prepaid phone minutes with bricks of cash. That’s where she realized that most of the world is still dependent on cash, but more importantly, most peoples of the world currently own cell phones. Realini came out of retirement and launched Obopay in Redwood City, California, in 2005. The big idea was to create a mobile payments system that would replace cash and check by allowing people to send or receive payments over their phone. In this way, businesses can take electronic payments on their cell phones, making checkout and payment faster and easier for customers. Obopay’s strength is that its platform is supported on every type of mobile phone, from traditional feature phones to smartphones, and spans from personal payments to business payments. For individuals, Obopay supports transfers from bank accounts, debit, and credit cards; for small businesses, Obopay supports a multitude of ways to accept payments, including through social networking sites, text messaging, smartphones, or in-store payments. In addition, Obopay provides flexible options for payments, so if the merchant doesn’t want to pay the small transaction fee, they can ask their customers to pay a small convenience fee instead. The option of charging customers a convenience fee, rather than having the merchant subsidize every fee, is a great option for non-profits taking donations. Realini is aggressively campaigning Obopay globally, forming partnerships with very large companies, such as Nokia, to drive mass adoption by small businesses. Intuit, a finance and marketing service provider based in Mountain View, California, processes about $17 billion each year through its Payments Solutions division. About two years ago, Intuit launched its GoPayment program for small businesses to expand their payments processing solutions to mobile phones. This way, even when you take your business out on the road, you can still take payments. After signing up for a merchant account, Intuit will send you a free card reader that’s used in conjunction with the mobile application. Then, it’s as easy as swiping the card through the reader, entering an amount, and charging it. The pricing plans are flexible, and there’s no set limit on how much money you can process. As Intuit is responsible for accounting software such as Quickbooks, Quicken, and Turbo Tax, GoPayment users enjoy an added bonus as it is the only mobile solution compatible with Quickbooks. If you’re one of the four million small businesses that uses Quickbooks, you won’t have to re-enter your transactions when you get back to the office. Verifone, the payment solutions company based out of San Jose, California, actually has two separate products aimed at two different kinds of retailers. For the very large retailers, Verifone offers the PAYware Mobile Enterprise; however, we’ll be focusing on Verifone’s product for smaller companies called PAYware Mobile. 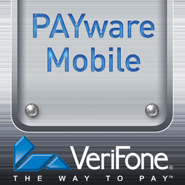 The PAYware Mobile system consists of three components: the mobile application, the encryption sleeve, and the Verifone gateway. The application works with the encryption sleeve, which is a sophisticated piece of hardware that allows you to swipe a card and the sleeve immediately keeps and protects the information. The Verifone gateway, the third and most important piece of the puzzle, provides connectivity between your phone and all of the various payment networks. “Our gateway is actually authenticating the piece of hardware that’s attached to your phone, and what that does is essentially ensures that hardware can never be used by an individual that’s not authorized to use it,” Rasori says. If a merchant has an existing account with a bank, no problem. PAYware Mobile doesn’t require businesses to create a merchant account, so this is a great option for those business owners who want less hassle with integrating mobile payments into their existing scheme. 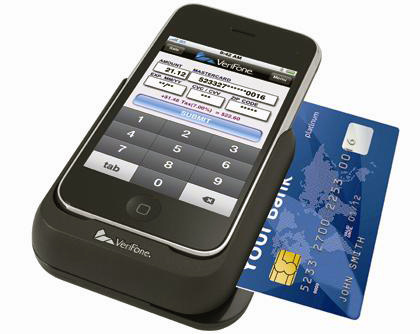 AppNinjas, a tech start-up based in Columbus, Ohio, acquired a mobile payments iPhone app called Swipe in May 2009. After landing the technology, the AppNinjas team sought out a hardware vendor to create a device for merchants to swipe credit and debit cards directly onto the phone. The finished product, a card swiper that clips into the bottom port of the iPhone, is free with every new account created. “We’re establishing a direct payment merchants account that millions of merchants in this country have and are using in other retail establishments,” says John Waldron, CEO of AppNinjas. 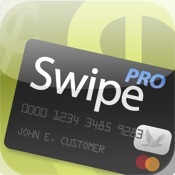 As far as costs go, the Swipe app is 99 cents at the App Store, and merchants will pay three different rates based on what kind of card is being used; in other words, expect to pay different fees for a credit or debit card versus an international, corporate, business, or government card. But if you’re new to mobile payments, you may opt for Swipe because of its simple design and excellent customer support. Swipe has already had north of 10,000 downloads, and thousands of active merchants currently using Swipe. If you’re looking for an extremely simple mobile payment solution, consider Square, a mobile payments start-up based in San Francisco, and co-founded by Twitter creator Jack Dorsey. While this system is extremely new—Square officially launched in February 2011—of all of the various available options, Square has the most straightforward system to accept payments and make money anywhere. Once you sign up for the service, Square will send you a free card reader, which plugs into the earphone jack of your Apple device or Android smartphone. You open the free Square app, you log in, and you can start accepting payments immediately. Square really prides itself on its simplicity and ease at which you use the program. Square also gives small businesses the analytics to know what their sales look like, so you always know where you stand. The 2.75 percent fee is immediately subtracted at the point of sale so you can instantly know how much you’ve netted that day. Other services will make you wait until the end of the week or month to view your total net profit. While Square allows users to accept unlimited payments, but payments over $1,000 may take 30 days to be transferred to your account. This default “cap” is a precautionary limit aimed at reducing the risk associated with charge backs, which can be quickly and easily adjusted. Increasing your overall payment ceiling is as easy as contacting Square’s support team and submitting some basic information about your business. Square is completely aware that many of their clients, such as photographers, can easily make over $1,000 per sale. Square surpassed the $200 million valuation mark nearly a year faster than Twitter did, and Jack Dorsey’s new venture is signing up over 100,000 new accounts each month.